Mom-to-be Neha Dhupia styled her baby bump in a fabulous Anita Dongre creation for the first of the many parties lined-up this festive son. Neha Dhupia and Angad Bedi dressed up to attend Arpita Khan and Aayush Sharma's Ganesh Chaturthi celebrations on Thursday evening. Neha shared pictures on Instagram and wrote: "All dressed up to whisper sweet somethings to Ganesh ji #ganpatibappamorya." Neha and Angad joined celebs such as Dia Mirza and Sahil Sangha, Malaika Arora, Maheep Kapoor, Ananya Panday along with Arpita's family - Arbaaz and Sohail Khan, Helen and Salim Khan - to welcome Lord Ganesh. Angad Bedi and Neha Dhupia make for a fabulous couple and they are often spotted on the trends lists. Last month, Neha and Angad walked the ramp for designer Payal Singhal at the Lakme Fashion Week. Neha Dhupia married Angad Bedi in May this year and three months after their hush hush wedding Neha and Angad announced they'll soon become parents. 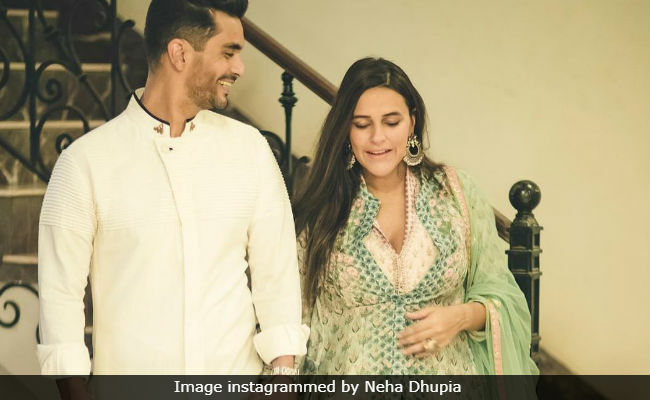 Neha Dhupia and Anand Bedi shared identical posts to announce her pregnancy. Neha Dhupia is currently filming the third season of her talk show No Filter Neha and she has already hosted celebs such as Ayushmann Khurrana and rapper Badshah. Neha was last seen in Lust Stories in Karan Johar's segment and she is awaiting the release of Helicopter Eela, co-starring Kajol. Angad Bedi, best known for his role in films such as Pink and Tiger Zinda Hai, was last seen in Soorma, co-starring Diljit Dosanjh and Taapsee Pannu. Angad, son of cricketer Bishan Singh Bedi, has also featured in TV series such as Inside Edge and 24.